Nothing lasts forever and everything, and everyone, has their time and in Death of the Inhumans, for the subjects of Black Bolt, the clock finally reaches midnight. After being set free millennia ago thanks to a prophecy that terrified the race that created them, the same vision of the future that gave the Inhumans their freedom, returns to damn them. 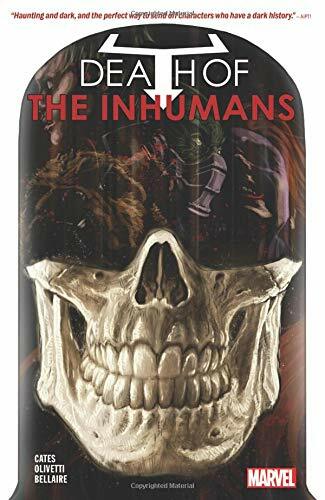 In swift, brutal and precise fashion Inhumans everywhere are targeted for extermination and wiped from the face of the Universe by their creators, who seem hell-bent on forcing Black Bolt to ally himself with their cause by any means necessary. But the King of the Inhumans isn’t the kind of man that can be forced into doing anything, especially when the people he leads are used in an attempt to break him and are treated like cattle being led to slaughter. So he responds in kind and sets out to rally the Five Tribes of Inhumanity, to have them join together to take the fight to the forces preying on them. But his enemy is cunning and having foreseen his course of action, prevent such a union from ever taking place and send Black Bolt and his family down a path that can, and will, only end with both sides drowning in their blood and when either the Kree or the Inhumans are erased from the pages of history.